Charter members of the Woodlawn Cemetery Association, organized in 1878, included William St. John, D.W. Curtiss, Henry S. Stebbins, Edward Malone, Herman D. Walbridge, Terome L. Stratton, C.P. Griffin, Henry Phillips, George Milburn, J. Kent Hamilton, Horace S. Walbridge, Charles E. Phillips, George B. Brown, Albert E. Macomber, Charles H. Eddy, E.B. Hall and Benjamin F. Griffin. They elected the first officers, Horace S. Walbridge and Charles B. Phillips as president and vice-president, respectively, and Herman D. Walbridge as treasurer. One of the original cemetery planners, architect Frank J. Scott, also helped develop Toledo's Old West End, an area where some of the city's most elite citizens once lived. Today it is recognized for having one of the largest collections of late Victorian and Edwardian mansions extant in America. Many of those who lived there now rest at nearby Woodlawn, their monuments and mausoleums as grand as their homes. 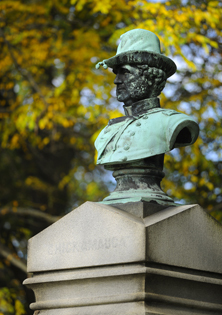 Woodlawn's first superintendent, horticulturalist Frank Eurich (1876-1900), had a distinguished career in cemetery management. He had been a member of the staff at the Centennial Exposition in Philadelphia and helped in the construction of its Memorial Hall. In 1887 he also co-founded the Association of American Cemetery Superintendents, to discuss recent trends and developments, as well as problems, in the cemetery business. Having assisted in the creation of twenty-five cemeteries based on Strauch's lawn plan, Eurich translated his ideas to Woodlawn, where he banned boxes, shells, toys, chairs, settees, benches and any other item "considered injurious to the beauty of the cemetery. 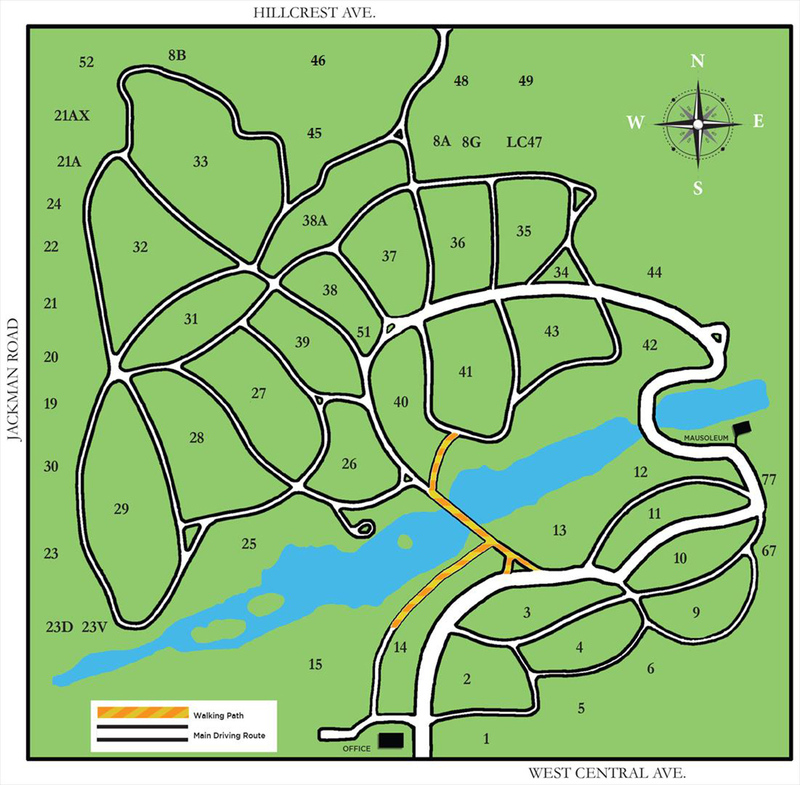 "(Note 11) Much of the original landscaping and extensive plantings on the site, the result of his hard work and vision, gained Woodlawn national recognition as an arboretum. By the late 1880's the Woodlawn Cemetery Association discussed the extension of a streetcar line to the site in order to make the burial grounds more accessible to those living in the city. In 1892 the Metropolitan Street Car Railway Company began to "construct, maintain and operate" a single track along Central Avenue, from the westerly city line to the cemetery gates opposite Auburn Avenue. (Note 16) By 1908, however, the city limits reached the Central Avenue boundary of the cemetery. Urban encroachment, the streetcar and a greater number of automobiles meant increased use of Woodlawn as a park. Woodlawn Cemetery contains forty-two mausoleums, the last of which was built during the 1950s. They represent the splendor and extravagance of some of Toledo's most wealthy and prominent families. Fashionable and popular at the turn of the century, mausoleums could accommodate several family members. Their construction entailed a major undertaking because granite had to be transported to the site without the aid of modern heavy machinery. Note 1 - Kenneth T. Jackson, Silent Cites: The Evolution Of the American Cemetery (New York: Princeton Architectural Press, 1989), 119; Stanley French, "The Cemetery as Cultural Institution: The Establishment of Mount Auburn and the 'Rural Cemetery' Movement." American Quarterly 26 (March 1974): 42. Note 2 - Charles 0. Jackson, Passing: The Vision of Death in America (Westport, Conn.: Greenwood Press, 1977), 61; French, "Cemetery as Cultural Institution," 59. Note 3 - David Charles Sloane, The Last Great Necessity: Cemeteries in American History (Baltimore: Johns Hopkins University Press, 1991), 46. Note 4 - Richard E. Meyer, Cemeteries and Gravemarkers: Voices of American Culture (Ann Arbor, Mich.: University Microfilms, Inc., 1989), 295. Note 5 - French, "Cemetery as Cultural Institution," 37-38; Sloane, Last Great Necessity, 46; Jules Zanger, "Mount Auburn Cemetery: The Silent Suburb," Landscape 24(1980): 24-26; William C.Clendaniel, "Rural Cemeteries: Guardians of Our Nation's Heritage," Cemetery Management 55 (January 1995): 6. Note 6 - Toledo's First Cemetery at Madison, 17th," Toledo Blade, 19 February 1957. Note 7 - Lucille B. Emch, "Two Anniversaries in Toledo, Ohio, in the American Bicentennial Year: The Hundredth for Woodlawn Cemetery and the Seventy-Fifth for the Lucas County Civil War Memorial," Northwest Ohio Quarterly 49 (Spring 1977): 44 - 45. Note 8 - In attendance at the meeting: Charles A Curtiss, W.W. Griffith, Richard Waite, WW Lockwood, John Jay Barker, Horace S. Walbridge, Herman D. Walbridge, Frank J. Scott, C.L. Luce, J.N. Viot, H.S. Bunker, H. Arms and M.V. Barbour. Note 9 - Emch, "Two Anniversaries in Toledo," 46-47; Woodlawn Cemetery (Toledo, Ohio: B.F. Wade Co., 1882), 2. Woodlawn Cemetery Collection (Woodlawn Collection), Canaday Center; University of Toledo. Note 10 - Blanche Linden-Ward and Sloane, "Spring Grove: The Founding of Cincinnati's Rural Cemetery, 1845-55," Queen City Heritage 43 (Spring 1985): 29-30; Proceedings of the Eleventh Annual Convention of American Cemetery Superintendents, 1897,22-23, Woodlawn Cemetery office, Toledo. Note 11 - Emch, "Two Anniversaries in Toledo," 45-46. Note 12 - Glenn Firebaugh, "The Trees of Woodlawn Cemetery," 1976 Naturalist Yearbook, Woodlawn Collection: Emch, "Two Anniversaries in Toledo," 48-49; "Letters, 1880-1900" box, Woodlawn Collection. Note 13 - Woodlawn Cemetery Association board of trustee minutes (board minutes), 1 March 1897, 4 December 1899, 6 March 1922, 5, 15 December 1927, Woodlawn Collection. Note 14 - Emch, "'Two Anniversaries in Toledo," 45-46. Note 15 - Woodlawn Cemetery Association, Glimpses of Woodlawn, (18837), Woodlawn Collection. Note 16 - Board minutes, 10 December 1887, 24 April 1890, 10, 20 May 1892, Woodlawn Collection. Note 17 - Board minutes, 5 July 1903, 7 September 1908, 7 June 1909, Woodlawn Collection; Description of Woodlawn Cemetery with the Dedicatory Exercises in the Chapel, 21 October 1883, 29-30, Woodlawn Collection; Zanger, "Mount Auburn," 23-28. Note 18 - " Letters, 1920s" box, Woodlawn Collection; cemetery deed books, Woodlawn Cemetery office. Note 20 - Board minutes, 3 October 1900, 6 June 1910, 12 September 1921, 2 June and 8 December 1930, 7 March 1932, 4 June 1934, Woodlawn Collection. Note 21 - Letter from Aaron Chesbrough to Woodlawn Cemetery Association, 13 June 1916, letter from the Superintendent of Woodlawn to Chesbrough, 21 June 1916, and letter from Chesbrough to Superintendent John Perrin, 19 September 1916, in "Letters, 1910s" box, and board minutes, 6 September 1916, all in Woodlawn Collection. By 1921 Chesbrough was at odds with the cemetery, this time also about the condition of the road. The arrangements made earlier proved insufficient and Chesbrough described the road as impassable. Once again he had become mired in the mud and had to be towed out by one of the cemetery teams. Annoyed and irritated, Chesbrough reminded the cemetery of his family's patience for the past thirty-five years and threatened the association with legal action, saying that he would not put up with "any such damn nonsense"; letter from Chesbrough to Woodlawn Cemetery Association, 3 March 1921. Woodlawn Collection. Note 22 - Board minutes, 14 February, 4 March, 3 June and 9 September 1901, 4 March, 3 June and 4 September 1912, 7, 18 April, 2 June and 1 December 1913, 7 December 1914,1 March and 1 May 1915, 3 December 1917, 6 March 1922, 5 March 1923, Woodlawn Collection. Note 23 - Emch, "'Two Anniversaries In Toledo," 43-54; "Memorial Day Marks Woodlawn Milestone," Toledo Blade, 31 May 1976; "Civil War Bust is Stolen from Woodlawn Cemetery," Toledo Blade, 17 December 1991. Note 24 - The Boy's Club of America, "The Gunckel Monument," Woodlawn Collection; "Lloyd Brothers: Going Beyond the Call of Duty," MB News (August 1993): 26-28. Note 25 - Sheila Otto, "Remarkable Markers," Toledo Blade Sunday Magazine, 15 May 1977, 5, 8, 11. Note 26 - Elizabeth Lesley, "Status is Alive Amid the Dead," Toledo Blade, 20 August 1989; ibid. Note 27 - Kenneth L. Ames, "Ideologies in Stone: Meanings in Victorian Gravestones," Journal of Popular Culture 14 (Spring 1981): 651. Note 28 - Bud Gauger, "Cemetery is Alive with Blooming Things," Toledo Blade, 2 May 1992; "Memorial Day is a Time for Memories and Mourning," Toledo Blade Sunday Magazine, 29 May 1994, 6; "Wo Kee Fong Body Buried to Await Transfer to China," Toledo Blade, 8 December 1944; board minutes, 23 October 1885, 7 September 1896, 8 December 1830, and President's Report for 1935, Woodlawn Collection. Note 29 - Board minutes, 30 March, 2 June and 8 December 1930, 7 March 1932, Woodlawn Collection. Note 30 - Board minutes, 29 June and 5 December 1932, 30 January, 7 February and 7 March 1933, Woodlawn Collection. Note 31 - Board minutes, 5 March and 7 September 1934, 4 April 1935, 18 October and 13 December 1937, and President's Report for 1935, Woodlawn Collection. Note 32 - Board minutes, 13 December 1937, 11, 31 January, 4 March and 28 September 1938, Woodlawn Collection. Note 33 - Board minutes, 4 December 1944, 9 April 1945, 29 April 1946, Woodlawn Collection. Note 34 - Tana Mosier Porter, Toledo Profile: A Sesquicentennial History (Toledo Sesquicentennial Committee, 1987), 110; board minutes, 13, 21 June 1951, Woodlawn Collection; "TMHA Promises Shift of Families," Toledo Times, 30 June 1950; "Extension South on Housing Lease," Toledo Blade, 19 July 1950. Note 35 - Toledo Blade, 13 January 1973, 17 October 1979, 19 May and 17, 19 December 1991, 15, 18 December 1993. Note 36 - Ames, "Ideologies in Stone," 642.